Good Morning Onward Nation — I’m Stephen Woessner and thank you so much for joining me today. For today’s solocast…I am going to share another lesson learned during my recent life-changing weekend visit to New York — but this time — we will shift our focus from leadership lessons learned at West Point — and now — we will turn our attention toward how and why you should create “Distinction” within your business. We will also delve deep into the importance of creating distinction within the hearts and minds of your customers through incredible experiences that not only meet expectations — but exceed expectations in phenomenal ways. To help make this lesson as practical and tactical as possible, I am going to share with you a complete illustration from the inside-out of what is, in my opinion, one of today’s most distinctive companies. And finally, I will share two recipes — or strategies — that you can take and apply into your business straightaway in order to help you…first…create your distinction…and second…help you communicate and share your distinctive story with your customers and prospects. Let’s begin with some foundation — a definition. What is distinction? According to my good friend and mentor, Scott McKain, companies that have reached the pinnacle of distinction are so uncommonly excellent, or their differentiation strategies are executed to such an extraordinary level of precision, that the companies become clear market leaders within their respective industries. You may remember Scott as my guest in Episodes 1 and 136 of Onward Nation. Scott is the world’s leading authority on the topic of creating distinction, he is also a highly sought-after speaker, bestselling author, and the host of the recently launched — and brilliant — podcast Project Distinct. Scott goes on to define distinctive companies as those that have created a “Category of One,” to borrow a term from Joe Calloway…our guest in episode 112 of Onward Nation. Unfortunately, in today’s hyper-competitive and global marketplace, instead of creating distinction, many business owners have become so afraid of losing out to the competition, that they actually strive to become all things to all people — and by doing so — they believe the “sameness” will bring them more customers. But it doesn’t work that way. Another powerful lesson I learned from Scott. So, who are some of the companies you might think of that excel at creating distinction? What companies deliver massive value to a thriving community of loyal customers — meanwhile — they have distanced themselves from competitors? Sure…there are some obvious choices. You might think of Apple, maybe Disney (YAY! ), Southwest Airlines, Zappos, or perhaps even Amazon come to mind. And indeed, these companies have worked hard at achieving their respective levels of distinction — but — these companies are also well known — and often cited for their marketing prowess. So I am going to share and then break down a lesson in distinction that came out of left field for me — and one that I learned during that epic trip to New York. It is a lesson learned first-hand while being a guest at NASDAQ for the opening bell of the SecureWorks initial public offering. SecureWorks was being spun off from Dell so the energy of the day was electric…it was absolutely off-the-charts. Before we get too deep into the lesson of distinction — let me give you some context as to how I was at the NASDAQ in the first place. If you have been listening to Onward Nation for a while now, you know that Don Yaeger is one of my most influential mentors and also a great friend. Once a year, Don, me, and a group of other friends get together to spend a weekend learning about each other’s businesses and doing some really cool stuff. Last year, we got together in Dallas, the year before it was Chicago, and this year was New York City. Don and his wife Jeanette planned an incredible agenda that included a day at West Point as the guest of Colonel Bernard Banks. When JR, one of Don’s former employees from 10+ years ago (who now works at the NASDAQ) happened to hear that Don was coming to New York City for the weekend, he invited Don and whoever else was in town by then to come to the NASDAQ and watch the company SecureWorks ring the bell. You want to talk about impactful mentorship, Onward Nation. That’s who Don is. JR had stayed in touch with Don over the years, and never forgot how Don had given him his first professional opportunity. And now JR was returning the favor by inviting us to come to the NASDAQ. So it was Friday morning — and the four of us who had flown in early, plus Don, walked from the Marriott Marquis across Times Square toward NASDAQ’s office. Charting a course to the NASDAQ was much easier than I thought because all we had to do was walk toward their 7-story tall video screen that was ablaze with their logo. Pretty hard to miss landmark! But the 7-story video screen didn’t just include NASDAQ’s branding. It was also rotating promos announcing the SecureWorks public offering — and that today was the day — the company was going public. Hmm. Distinction lesson #1: NASDAQ created distinction by leveraging its prominent and incredibly valuable real estate inside Times Square to advertise a very special day in the life of one of its customers. Its real estate had become a unique selling proposition. As we walked into NASDAQ’s lobby, the five of us were greeted by security officers and the check-in process was similar to what you might experience at the airport with TSA. We had to show our photo IDs, pass through a metal detector, sign-in, and state who we were there to meet. Our agenda consisted of a tour through NASDAQ’s impressive and highly sophisticated office suite, television studios, as well as the area where NASDAQ’s analysts and account managers crunch numbers for clients all day long. Onward Nation, the atmosphere was electric — many of the walls within the suite were nothing more than large screens with ticker symbols, after hours trading data, and photos flashing from earlier presentations with SecureWorks executives and family members. It was easy to see that something special was going to happen shortly! The tension was building. We had about 30-minutes before the bell ringing presentation, so several members of the NASDAQ team fielded a barrage of questions from our group. It was from this Q&A that we learned how fiercely competitive NASDAQ and the New York Stock Exchange are with their attracting, recruiting, and in some cases, persuading listings to leave one stock exchange and join another. Ah, the need to create distinction, Onward Nation! And it was during this conversation, that we all learned how the NASDAQ had created just that. Distinction lesson #2: when the NASDAQ executive team goes out to meet with “Company 1-2-3” who is working through the process of going public, the team highlights the names of all the high-profile companies like Microsoft, Google, Amazon, and many others that are already listed on their exchange and not the NYSE. The NASDAQ does an excellent job of leveraging the Inner Circle Principle that we talk about a lot here during Onward Nation episodes. Think of it this way — when someone invites you to a party — one of the questions you may ask yourself (but might be embarrassed to admit) is, “Hmm, I wonder who else is going?” And you won’t commit until you know the guest list. The team at NASDAQ knows this — and they fully use it — to their advantage. So let’s say Company 1-2-3 likes the fact they will be associated with some of the biggest most sophisticated brands in the world — but — they are just not convinced that NASDAQ is where they should trade. No problem…then the NASDAQ takes their value proposition further with distinction lesson #3. They illustrate their best in class — world class — trading technology that is actually licensed by other exchanges around the world. Don’t the shareholders of Company 1-2-3 deserve the best service from the best platform? Nice. But wait…the NASDAQ’s distinctiveness doesn’t stop there. Nope. Here comes lesson #4. They also show Company 1-2-3 the impressive facility and studio at NASDAQ — and — explain that Company 1-2-3 is welcome to use its space to host meetings with analysts…use it for product rollouts…or other functions in order to put the best foot forward to its investors. Nice…times 2! But wait…still not done. Let’s now loop back to the video screen in Times Square for distinction lesson #5. On the day that Company 1-2-3 goes public, yep, the NASDAQ will broadcast the company’s bell ringing presentation onto its 7-story video screen so everyone in Times Square — in the heart of Manhattan — so everyone can see the event. Awesome…times 3! Oh…but just when the executives of Company 1-2-3 begin to reach for their pen to sign on the dotted line…the NASDAQ team lays down one more piece of distinction…lesson #6…they are actually less expensive than the NYSE, too. That is serious distinction, Onward Nation. Impressive inner circle, state-of-the-art facility with every amenity and piece of tech you could want and need, broadcasted out into Times Square…and oh wait…they are less expensive, too. Massive value — and massive distinction. But wait — there’s more. The actual bell ringing celebration! We were in the studio for the bell ring. To be there — when a company went public — was one of the most incredible experiences of my professional career. The presentations that morning from NASDAQ executives welcomed SecureWorks into a private club of sorts — a new home — a new experience — a new future. Then the founder of SecureWorks shared a brief history of their 16-year company and the path that lead up to that historic day. Then — and I am getting goosebumps just thinking about it again — we could see and hear the production crew from NASDAQ quickly usher all of the SecureWorks employees and family members in attendance up onto the stage surrounding the podium. And then the studio erupted with loud music and lights as the countdown began from 10! Then 9 — flashed up on the video screen in huge white numbers…then 8 — and the video feed from the studio was broadcasted out into Times Square! Then 7…then 6…then 5…and when the countdown hit 1…the bell rang — and SecureWorks was now public company…immediately followed by cheers, shouts of joy, and an explosion of confetti shot into the air. There were handshakes, there were high-fives, and there were tears of joy amongst all of the SecureWorks group. It was an honor to watch the scene unfold. It was an experience the SecureWorks team will remember for the rest of their lives — just like I will. And that’s the point. 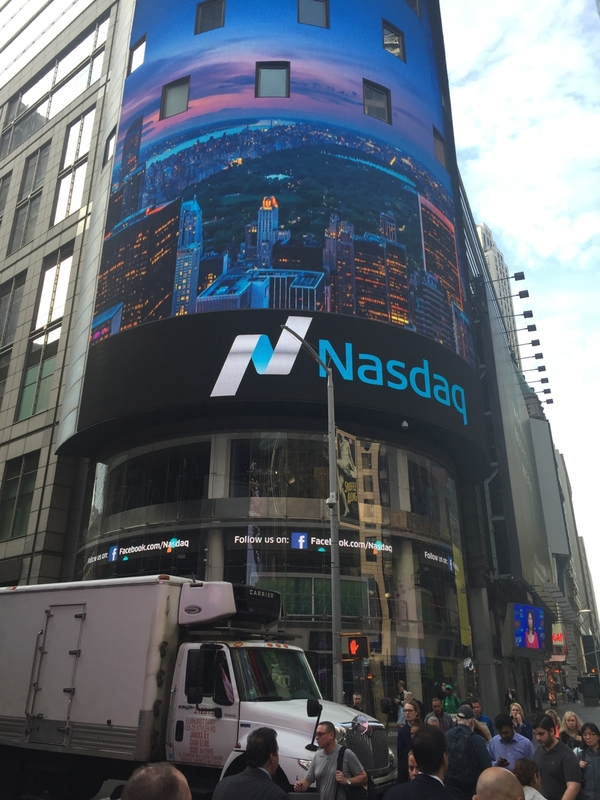 That’s distinctiveness, Onward Nation…NASDAQ and their team rocked every aspect of the customer experience! And yes, you’re right…it didn’t end there. 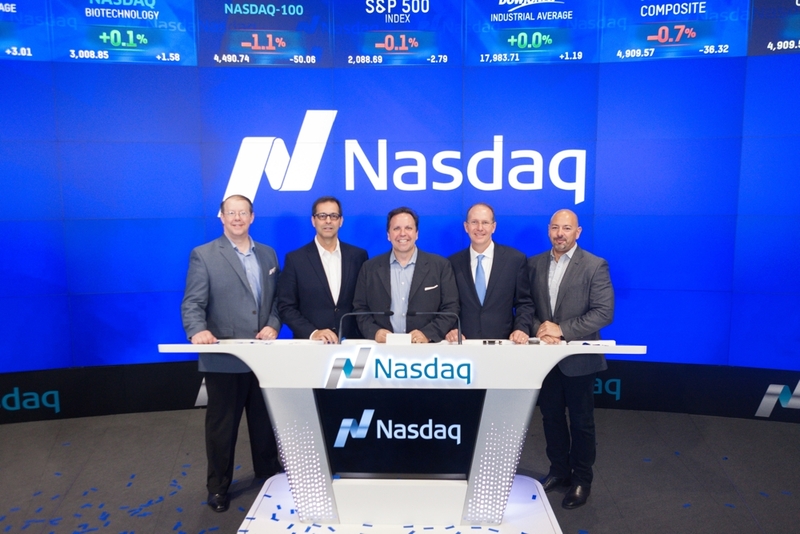 Once the NASDAQ crew had ushered out the SecureWorks crowd of about 100 people…the studio was empty…and they asked Don if he would like to get a photo with our group at the podium on stage. The NASDAQ photographer certainly didn’t have to make time for us to do that. We were guests for the opening bell — we weren’t part of the SecureWorks entourage. But they did it anyway…and now…this distinctive experience will be something we all cherish forever. And…if we take Predictive ROI public in the future…odds are pretty darn good we will be listing with the incredible team at NASDAQ! So now let’s shift gears and think about how you can create — or deepen — the distinction inside your business. Now, please don’t allow yourself to buy into the excuse of… “Oh, we don’t do anything unique and different here. Nothing stands out as being extraordinary inside our business.” Because if you are thinking that, Onward Nation…you need to recognize that is the imposter syndrome you’re hearing inside your head and it is trying to cheat you out of your destiny. It is so easy to overlook, or fail to clearly define, all of the distinctively awesome, wonderful, and beautiful things we do inside our businesses everyday. How we improve the lives of our customers. How we bring value. How we deliver exceptional customer experiences. Before you say something like, “But, Stephen, there isn’t anything distinctive about what I do,” I challenge you with this — if there wasn’t something truly distinctive and different about what you do, then you wouldn’t have a business. So whether your business is thriving, stuck on a plateau, or declining, you will make this your best year ever if you focus on defining and creating “distinction” for your business as one of your most vital priorities. Distinction can be your secret weapon this month — this quarter — this year. It’s that powerful, Onward Nation! And once you create your distinction, it will give you a persuasive story to share with all of your customers and prospects through your social media platforms. So how do we create distinction? 1. Clarity. Distinctive businesses are crystal clear about what makes them unique. They know what they are and what they are NOT. You cannot differentiate what you cannot define. 2. Creativity. To be distinctive, you don’t have to do everything creatively, in fact, be unique at just one point, and you can dominate your marketplace. For example, Enterprise Rent-A-Car picks you up. It’s their one thing — and they do it incredibly well. 3. Communication. While customers and prospects truly desire information, they want the details placed within a compelling narrative (or story) that they can relate to and remember. 4. Customer experience focus. Distinctive businesses plan customer retention with as much passion and precision as they strategize customer acquisition. You can turn prospects into customers and customers into champions for your business. In addition to Scott’s two incredible interviews on Onward Nation — I want to share another educational resource with you. I asked Scott to sit down with me when we were both in San Diego so we could do a video interview together about the practical and tactical steps any business owner can apply to create distinction. The level of detail he provided will give you an accelerated MBA in creating distinction. It’s that good. Here it is. So, Onward Nation…let’s say you work through the process of creating the distinction Scott recommends and you are ready to share the powerful message with customers and prospects. Well, Darren Hardy, former publisher of SUCCESS Magazine and one of my mentors, shared with me his formula — his recipe — his strategy for doing just that. He calls it the “Aikido Strategy”…just like the martial art Aikido. For example, let’s say someone attempts to physically attack you. You have several choices. You can run. You can try to meet their force and energy head on — but if they are stronger than you — you could be overpowered in a hurry. Or, you could use Aikido techniques to redirect your attacker’s energy, or their resistance, to someplace else and away from you. From a sales perspective, we call this the Feel – Felt – Found Method and it is a powerful strategy for disarming the resistance of objections and sharing or establishing one’s distinction. Onward Nation…before you can dazzle your prospective clients with your newly created distinction, you need to show how you understand their pain, frustrations, hope, and aspirations of who you are speaking with. You and your company need to become a HOPE dealer to your prospective clients. “Here’s what I believe in for you…” within your email campaigns, in your conversations, in your meetings, and in your presentations. Here’s what I believe in for you — paint the picture of possibilities for your audience. Just think back to President Obama’s 2008 campaign — and whether you voted for him or not is irrelevant — from a marketing perspective — his Hope and Change campaign was brilliant and masterfully executed. Next, you need to use language that creates an alliance between your distinction and your prospective clients. People need someone to empower them – lead them – to provide CERTAINTY. Onward Nation, you can be that person for them. If you want a great resource for this…I encourage you to check out the “Thank you, Mom” campaign produced by Procter & Gamble. It is a masterful display of creating an alliance between a company’s distinction and the emotional needs of its target audience. Next, we’re going to break the Aikido Strategy down even further with a five step workshop. If you and your team take the time to answer the following questions from the Feel – Felt – Found Method — and from your client’s perspective as they consider what truly makes you and your company distinctive — then you will jettison light years ahead of the majority of your competitors. Q1: What do your prospective clients FEEL? What are their pains, frustrations, hopes, and aspirations? Q2: When have we FELT these same feelings? Q3: When and how did we FIND a solution? Q4: How, when, and where can we be a better HOPE dealer to our prospective clients? Q5: How, when, and where can we create and message our ALLIANCE with our prospective clients? Again…if you and your team sit down to identify how you can become distinctive — or what already makes you distinctive by following Scott McKain’s advice — and then completing the Aikido Strategy Workshop so you can communicate your distinction from the correct emotional perspective — you will win, and you will win huge, Onward Nation! And with that said…I will leave you with a very big THANK YOU! We all have the same 86,400 seconds in a day and my hope for you is that today’s solocast was a valuable exchange of your time and a helpful resource. Thank you for being here with me this morning — and please continue to let me know what you think of Onward Nation…good or bad…I always want your feedback. My direct email address is stephen@onwardnation.com — and yes — that is my actual Inbox. No fancy filters or filing system and I read and reply to every single email. We will be back tomorrow with a lesson packed interview with Michael Glauser. You will not want to miss our discussion around the differences that make the difference. It is compelling, thought provoking, and will help you increase your productivity by focusing on the priorities that truly matter most. You will not want to miss this discussion, Onward Nation!